Barpa Langass. Entrance to passage. Barpa Langass. 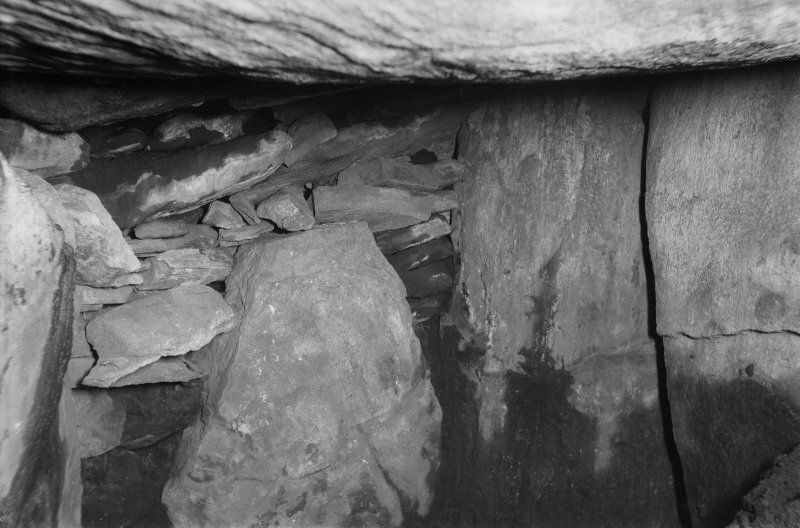 Interior of chamber. 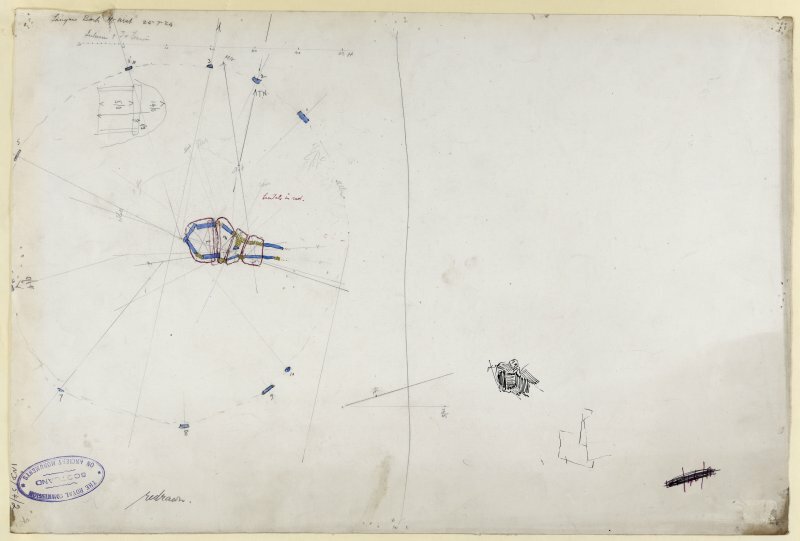 Pencil plan of Barpa Langass, probably based on a measured sketch. Barpa langass. General view, chambered tomb. 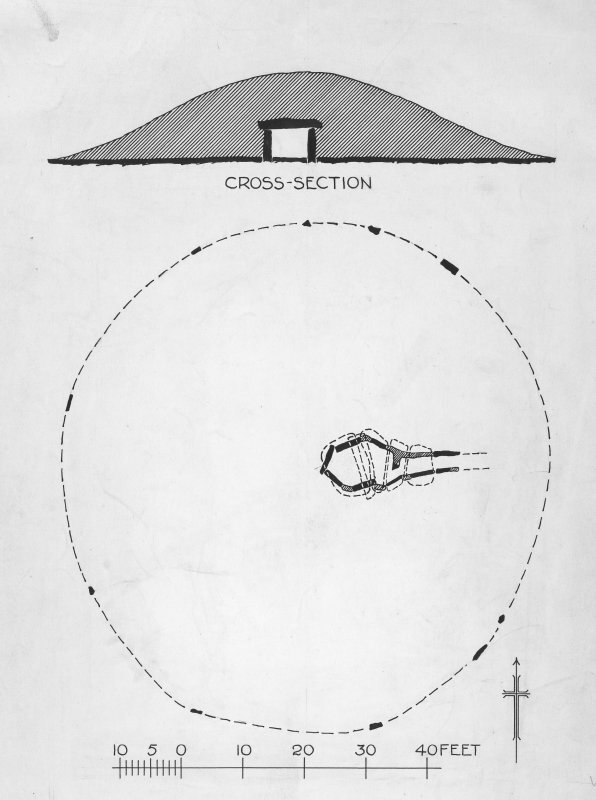 Publication plan and section: Barpa Langass. General shot of Barpa Langass. 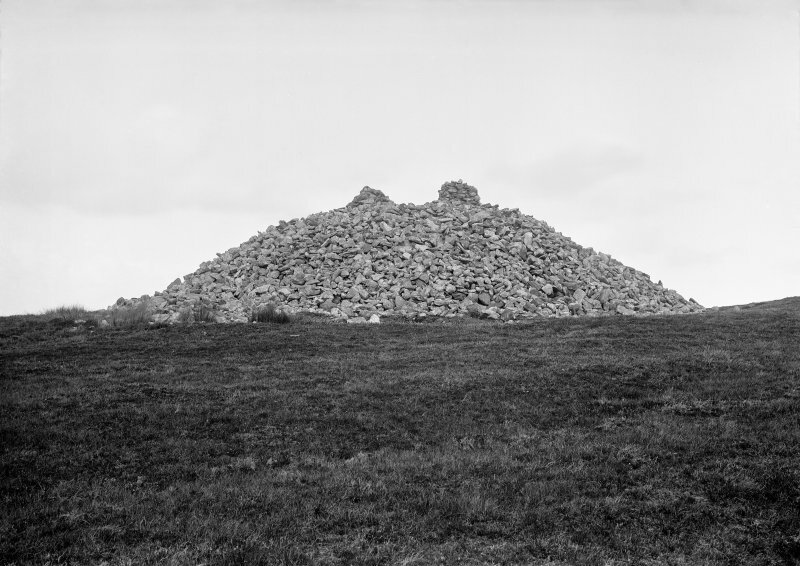 Barpa Langass, 3rd millennium bc The tumulus of some eminent warrior, or perhaps of a Neolithic tribe, this is one of the best survivals of a barpa or massive chambered cairn of the passage-grave type. 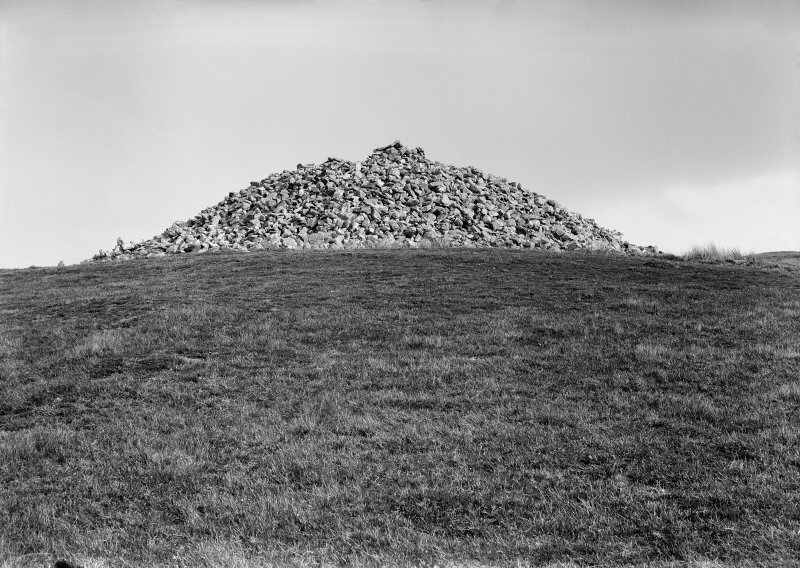 Prominent on the hillside, the circular mound of stones conceals the only known intact megalithic chamber in the Western Isles. 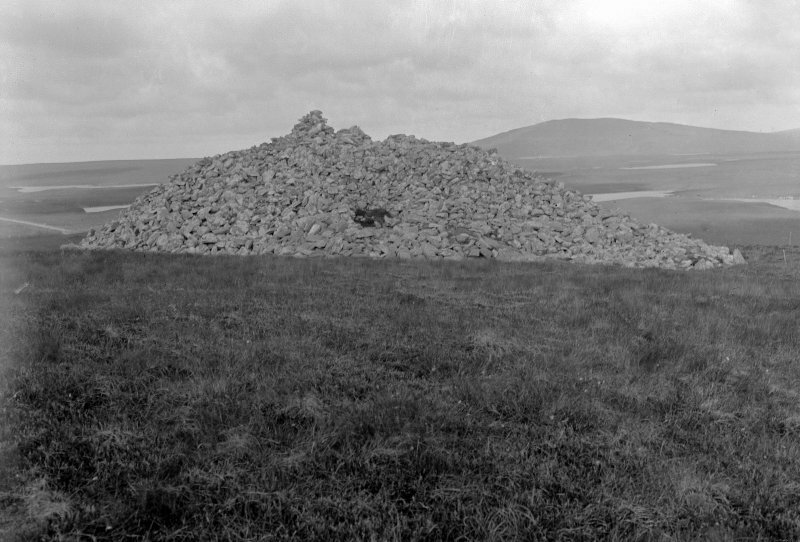 Barpa Langass, a large cairn some 25m in diameter and 4m in height, on the western slopes of Ben Langass, is immediately obvious to anyone passing along the Lochmaddy-Clachan road; a passage-grave, it is the only chambered cairn in the Western Isles which is known to retain its chamber intact. 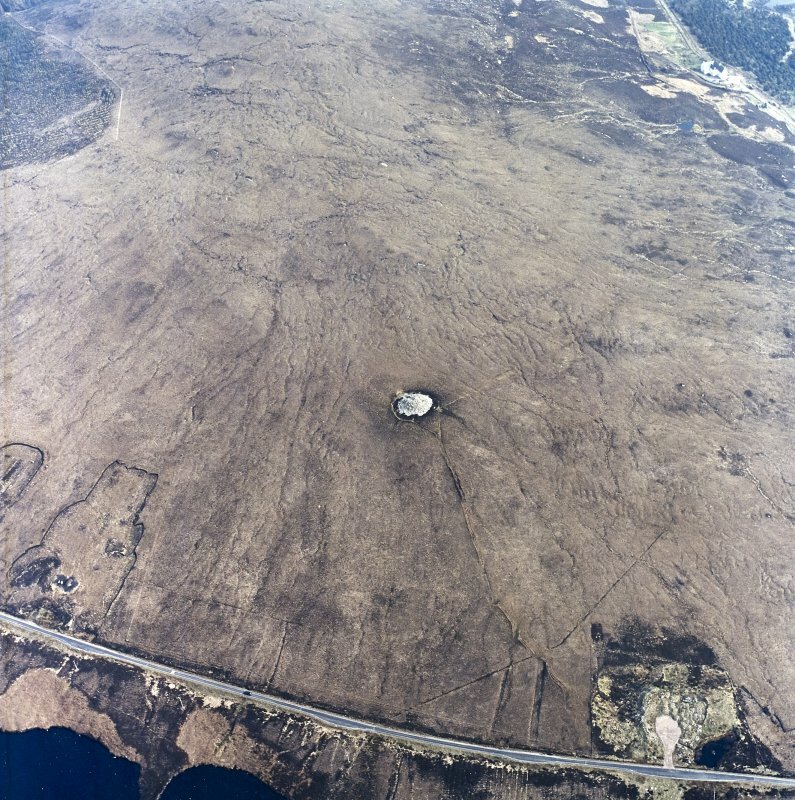 Kerb-stones may still be seen in places around the circular cairn, especially on the northern side, and the line of stones forming the north side of the forecourt is still visible. 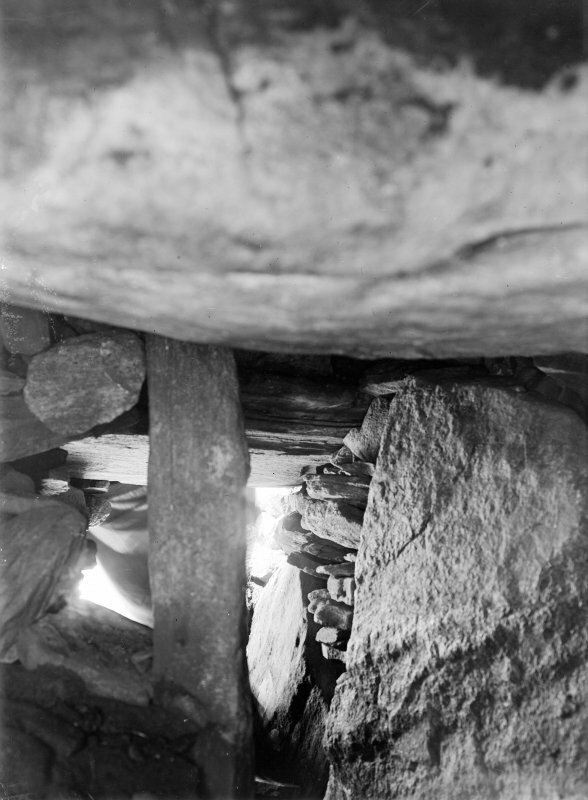 The passage itself is about 4m long; some of the lintels are missing from the outer end, which is partially blocked by fallen stones. The walls are formed by large slabs with some drystone walling above. 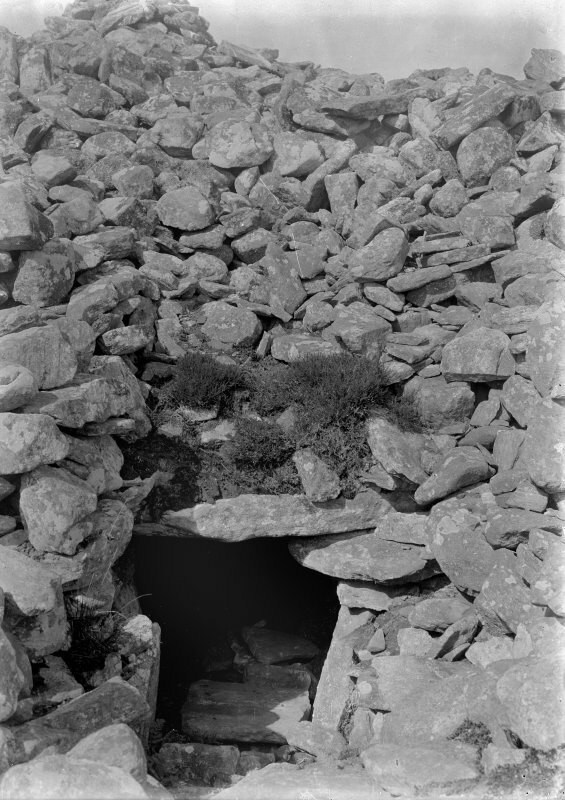 At the inner end, a tall stone supporting a broken roofmg slab partially blocks the passage. 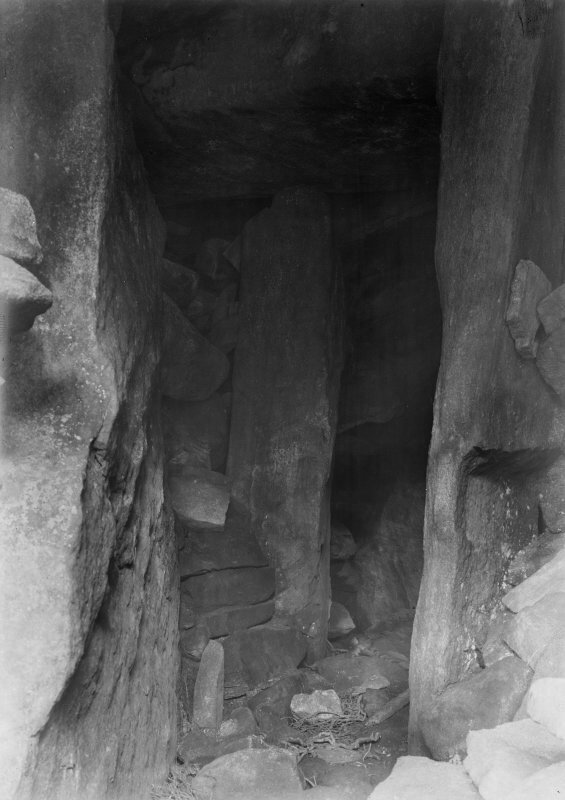 The chamber is oval on plan, measuring 4m by 1.8m, and is formed of very large upright slabs with drystone walling between and above them. Excavation in the early years of this century produced some sherds of beaker pottery, a flint arrowhead and flakes as well as burnt bones. 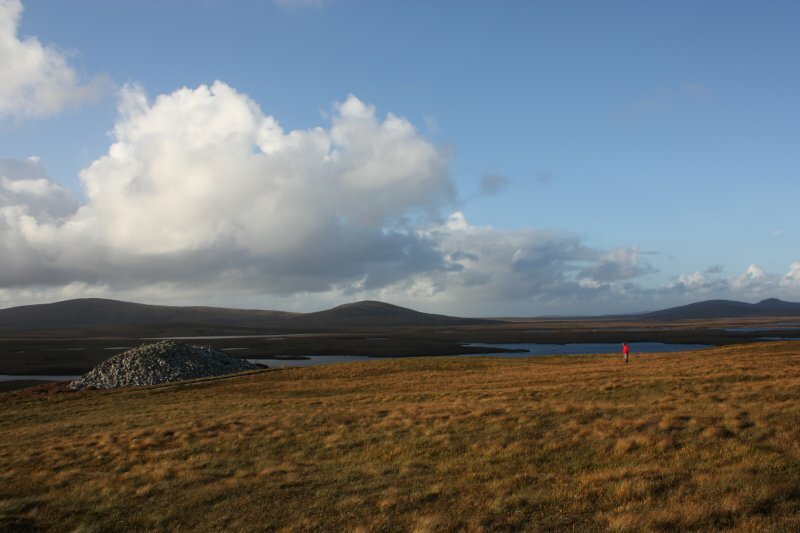 Walk south-east for 1km or directly east to the top of Ben Langass and then south down the hill towards the loch to find the stone 'circle' Pobull Fhinn (NF 842650). 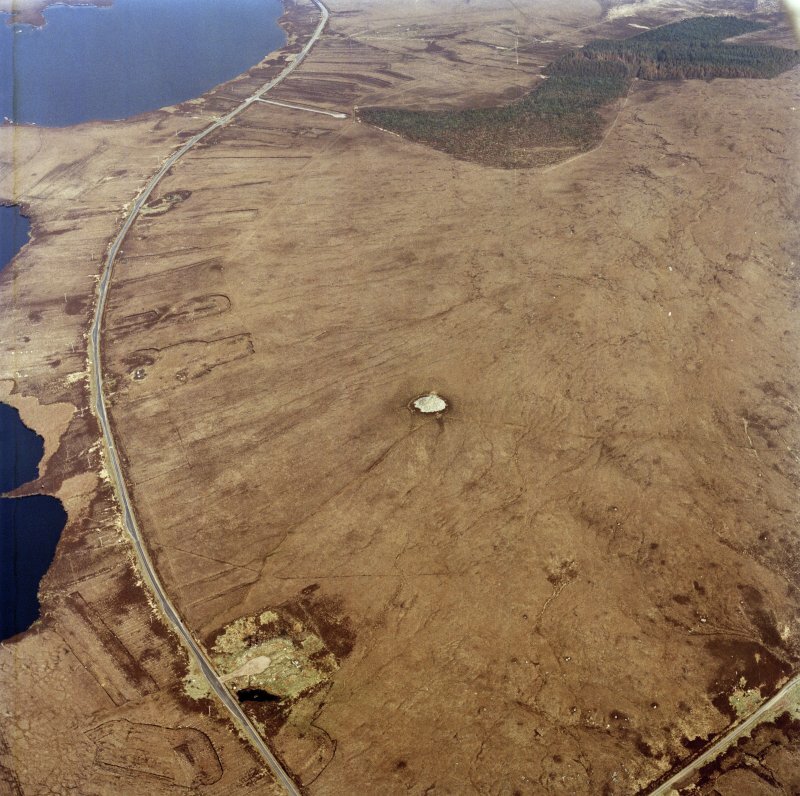 The monument may also be approached by following the track to Langass Lodge and continuing along the slope on much the same line. 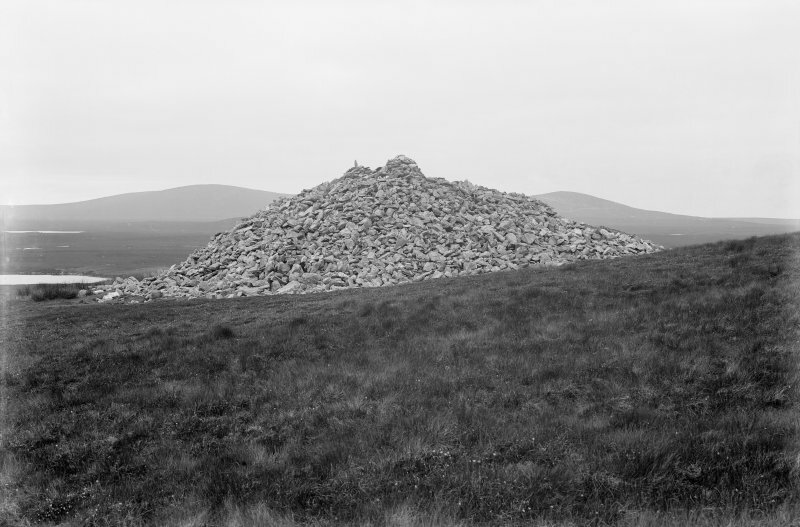 Pobull Fhinn, on the southern slopes of Ben Langass, is an oval setting of irregular shaped stones, enclosing an area which has been partially terraced; the slope is cut into on the uphill side and possibly built up a little on the downhill side. 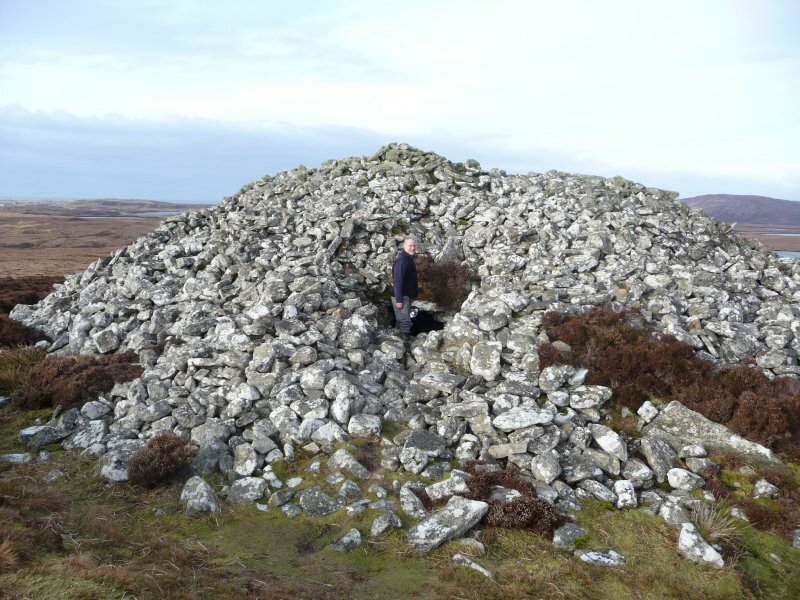 This chambered cairn is as described and planned by Henshall and is protected as a scheduled ancient monument. 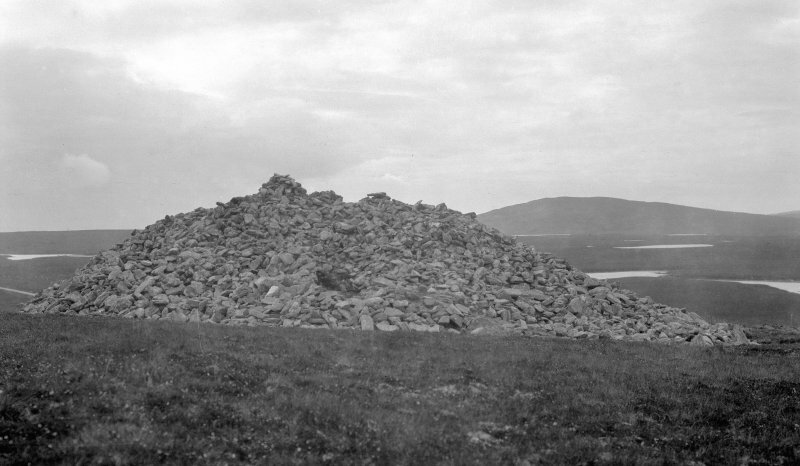 It is an impressive mound of grey stones, standing on the hillside looking NW across Loch a’ Bharpa. 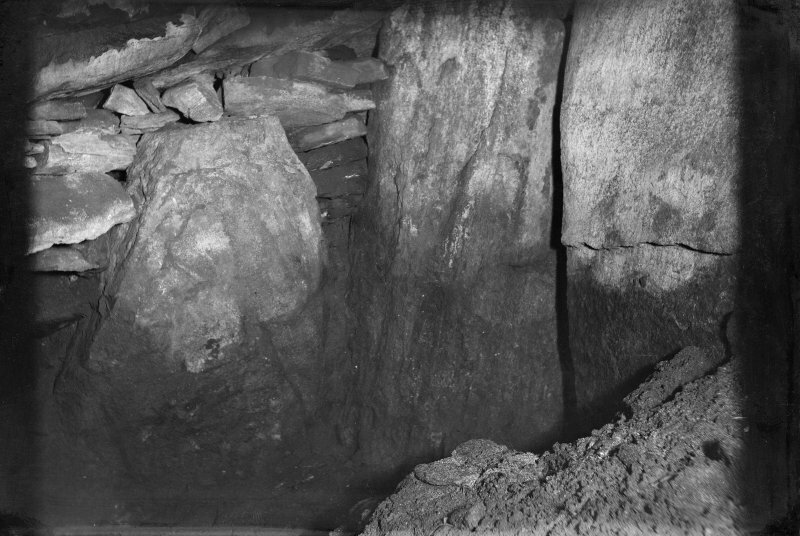 A peristalith of spaced slabs defines its perimeter, but this lies some way out from the steep flanks of the mound covering the chamber, suggesting that a certain amount of disturbance and reconstruction has taken place, so much so that the capstones are buried beneath a far greater depth of cairn material than has been observed elsewhere. The passage approaches the chamber from the E and has evidently undergone some reconstruction at its inner end, work that possibly also includes the coursed masonry forming its N wall. 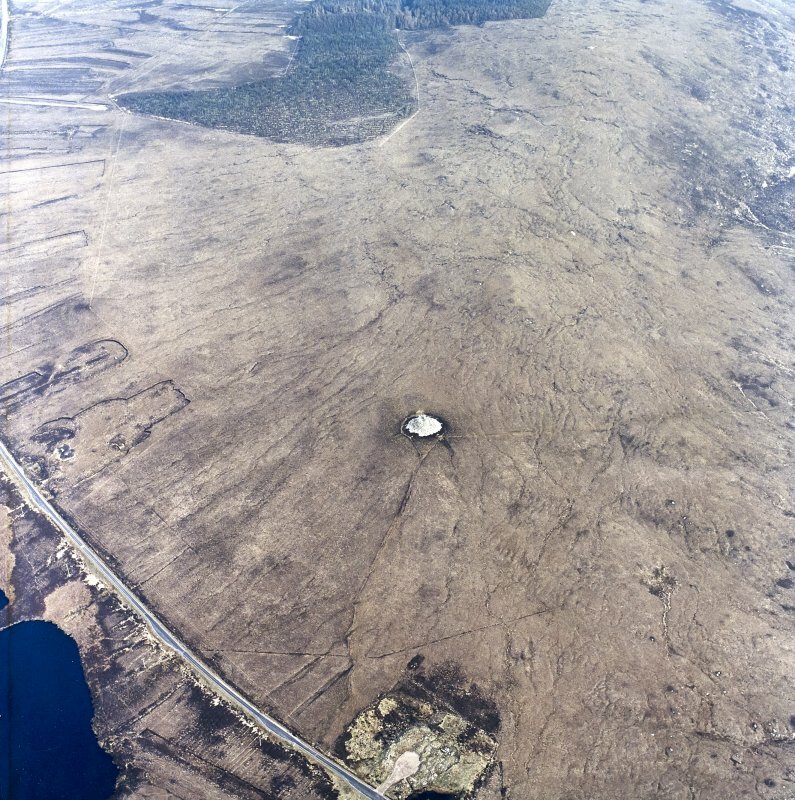 The cairn gives the appearance of standing in a shallow hollow, but this seems to be the result of differential peat growth, which has not encroached upon the better-drained matrix of the cairn material.